Located at the foot of picturesque Taos Mountain, the Cottonwood Inn Bed and Breakfast offers the perfect combination of country comfort and casual elegance. 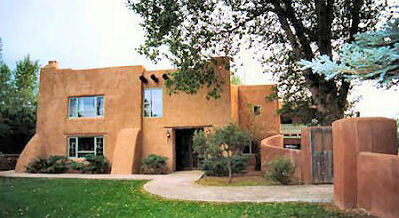 A renovated two-story adobe blending romance, charm and the natural beauty of Northern New Mexico, this Taos Bed and Breakfast features 8 uniquely decorated rooms, a spacious common room and a comfortable dining room to savor your morning breakfast. The Cottonwood Inn provides 8 guest rooms with private baths. Each room is unique in style and decor, featuring original art and furnished for luxury and comfort. Additionally you will find 300 thread count all cotton sheets, down pillows and comforters. This and other New Mexico Bed and Breakfast Inns can be found here online in The Register.